woodcut cut in the "black line" technique 8.4" x 11.7"
"The Woodcut - the oldest example of this, the earliest form of engraving - which has been used by the Chinese for over a thousand years - is from the middle of the ninth century, A.D. But the woodcut as we know it first appeared in the middle of the fifteenth century. It very quickly became more popular than any pictorial medium then in use among the common people, which is a marked contrast to the present day limited and signed proofs for the dealer, collector, and speculator in fine prints. The list of artists who have made woodcuts, from Durer to our own day, is a very long one. A preoccupation in the eighteenth century with the metal plate was followed by a revival in the following century and a subsequent decadence into magazine illustration. With the invention of photography and photo-engraving for reproduction on a mass scale, the woodcut almost ceased to exist. During this low ebb, small groups of artists on the continent and in America kept the craft alive until, at the trun of the present century, a new interest burst forth. Today, a great tradition in the art of the woodcut is being established. Technically, the woodcut requires not only a knowledge of drawing but skill in a distinct kind of craftsmanship. Much more than "hacking" at the wood is necessary. Clarity in design and expression in both line and area are most important. The woodcut is done on soft wood, the long-grain plank of apple, pear, beech, cherry - and also linoleum. All woods used are type high, planed flat and sandpapered very smooth. The design is either drawn directly or traced upon the block, and the method, roughly is is to cut away all white or light areas, leaving the black lines and areas raised, as that, when inked, they will print on paper under pressure. A knife or carver is used for incising the line and chisels or similar tools are used to clean out superfluous wood. In wood engraving a hard, closely-grained wood - such as box or maple - is used. The block is cut across the grain of the tree, and an entirely different set of tools must be employed - burins or gravers and tint tools of different sizes and shapes whose capacities for varying degrees of fine lines and large spaces allow more profuse tonal and color variations that is possible in the woodcut. Printing, as in all graphic arts, requires a great deal of skill. Perhaps the best method is with the Washington-Franklin proofing press, or the flat-bed press. But good proofs have been made with the burnisher, the back of a spoon, a Japanese baren, a roller, the old-fashioned letter press - and even the foot." "Known more formally as xylography*, woodcut is a relief printing process in which the illustration to be printed is carved into a block of wood along the grain - unlike wood engraving, which is cut into the end-grain. The block is then inked and printed by stamping, rolling or pressing against a medium (paper for books, although the technique was first used in China as early as the 3rd century Common Era to print textiles)." * The art of carving the woodcut is technically known as xylography, though the term is rarely used in English.  What is Wood Engraving? Linocut is a printmaking technique, a variant of woodcut in which a sheet of linoleum (sometimes mounted on a wooden block) is used for the relief surface. A design is cut into the linoleum surface with a sharp knife, V-shaped chisel or gouge, with the raised (uncarved) areas representing a reversal (mirror image) of the parts to show printed. The linoleum sheet is inked with a roller (called a brayer), and then impressed onto paper or fabric. The actual printing can be done by hand or with a press. . . . the linocut printing technique was used first by the artists of Die Brucke in Germany between 1905‚ AD where it had been similarly used for wallpaper printing. They initially described their prints as woodcuts however, which sounded more respectable. . .
Color linocuts can be made by using a different block for each color as in a woodcut, but, as Pablo Picasso demonstrated quite effectively, such prints can also be achieved using a single piece of linoleum in what is called the 'reductive' print method. Essentially, after each successive color is imprinted onto the paper, the artist then cleans the lino plate and cuts away what will not be imprinted for the subsequently applied color. "Chiaroscuro woodcuts are old master prints in woodcut using two or more blocks printed in different colors. . . They were first invented by Hans Burgkmair in Germany in 1508, and first made in Italy by Ugo da Carpi before 1516. Other printmakers to use the technique include Cranach, Hans Baldung Grien and Parmigianino. 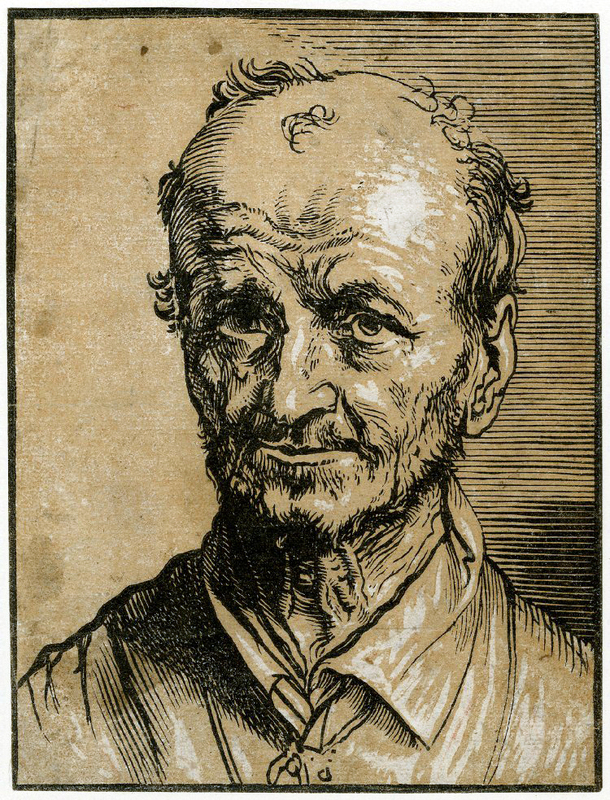 In Germany the technique was only in use for a few years around 1520, but Italians continued to use it throughout the sixteenth century, and later artists like Goltzius sometimes made use of it. . . In some German two-block prints, the keyblock (or "line block") was printed in black and the tone block or blocks had flat areas of colour. In Italy, chiaroscuro woodcuts were produced without keyblocks to achieve a very different effect. They resembled the style of wash drawings also known as chiaroscuro." Printed books were first illustrated using woodcuts - An early example of woodblock printing on paper was discovered in 1974 in an excavation in Xi'an, Shaanxi, China, whereby individual sheets of paper were pressed into wooden blocks with the text and illustrations carved into them. It is a dharani sutra printed on hemp paper and dated to 650 to 670 CE, during Tang Dynasty (618-907). Wikipedi) A later book combing both text and image woodcuts, The Diamond Sutra was printed in China in the 9th century CE. "The first crude woodcuts appeared in Europe by 1400. Given the difficulties of scraping out the wood between the lines to be printed, and the danger that lines that were too thin would break under pressure, early woodcuts consisted mainly of thick outlines with minimal shading." - (Heilbrunn Timeline of Art History). 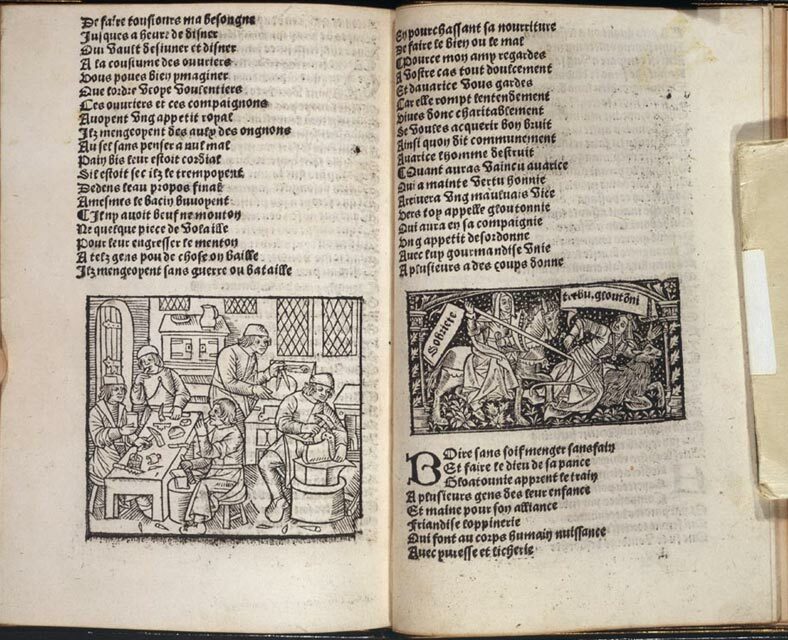 From the mid-15th century some books in western Europe, known as block books also called xyloographica, had both their text and their images printed as woodcuts as a less expensive alternative to setting the text from movable type. "KIBYOSHI, a genre of Japanese picture book, printed during the middle of the Edo period (from 1775 to the early 19th century) are physically identifiable by their yellow-backed covers. Kibosh were typically printed in 10 page volumes, many spanning two to three volumes in length, with the average number of total pages being 30. Considered to be the first purely adult comic book in Japanese literature, a large picture spans each page, with descriptive prose and dialogue filling the blank spaces in the image. Due to the numerous characters and letters in the Japanese language, moveable type took longer to catch on in Japan; it was easier to carve the text directly onto the same wood block as the illustration. This allowed for a close and harmonious interaction between image and text, with either a balance of both elements, or text dominating the image." Image size 7 1/2" x 12"
The colors used in Interference including cream of paper (left) and black of key block (right). wood engraving 10.5" x 9"
Many wood-engravers begin by drawing their design in complete detail on the block before cutting. Miss Heller prefers to sketch in the rough composition and then improvise on the wood as she goes along - or, as she puts it, "I begin thinking in terms of the wood; only in this way can original creation take place." As one can see by the moving forms in Nocturne, the artist is deeply concerned with the power of suggestion in art - a power potent enough to "call spirits from the vastly deep." Conceived in abstract terms it is still lucid enough to make the meaning plain. It is indeed a compelling print, full of the awesome shapes and terrors that prowl in the depths of the subconscious; it is that fearful time of night when the powers of darkness take possession of a mind asleep. "I am a forerunner in the development of composition into a phase of psychology," observed Miss Heller, "by discovering ways of conveying emotions through abstractions. My product is completely creative; entirely divorced from the motive of conveying authors' images. As with her images Prairie Child aka Star-Child aka Witchfire, Helen West Heller used themes and compositions in more than one medium. She used similar compositions in a number of paintings and woodcuts; sometime the painting was executed first and at other times the painting was executed after the woodcut. In the examples above, Razorbacks (1932 and Cabin (1933) the painting was done directly from the woodcut - the same for Doer, Knower, Sayer (1932 and 34). In the painting and wood-engraving, Intersection of Three Streets (1929) the wood-engraving was executed after the painting. Other examples include: the oil painting Baseball (1929) after the woodcut Baseball (1928); The watercolor The All Seeing Eye (1929) after the wood engraving Nocturne (1928); the woodcut Pulling Beets (1931) and the painting Pulling Turnips (c.1932); the woodcut Jacob and Angel (1932) and painting Jacob's Angel (c.1933); the woodcut Proteus as Shepard (1932) and painting Jacob and His Sheep (nd); the woodcut and painting sharpening scythe (c. 1933); the tempera Southwest (1941) and woodcut Southwest (1942); and the woodcut Sugaring Off (1941) and painting Sugaring Off (1943) - see images above. Growing up in a mid-western farming community, it is not surprising that many of Helen West Heller's art works and poems depict rural farm life and nature motifs. Apple picking was an especially popular theme for the artist - not surprising since as a child and young woman Helena Barnhart most likely worked in her parent's apple orchard in Canton, Illinois. She depicted apple picking in the painting and prints above, and also on the missing panel titled "picking apples" for her mural Children at Work and Play in the Neponsit Beach Hospital on Long Island.